Sorry, Dead Pals of Sam Sanfillippo is permanently closed. 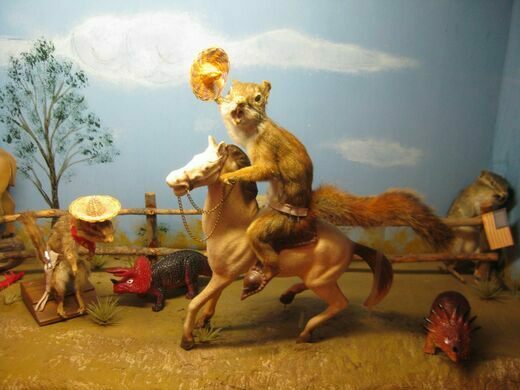 A funeral director and taxidermist, Sam Sanfillippo opened up a gallery of his more creative works in the basement of the low-slung brick funeral parlor that he owns and operates in Madison, Wisconsin. A bronze plaque marks the site of the only show the King of the Soul Singers ever missed. Hundreds of squirrels, badgers, fish (including a 500-pound blue marlin), and various and sundry other animals are preserved in various poses. 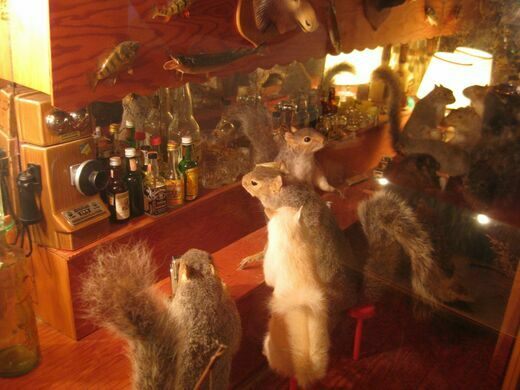 Many of the displays, which are open free of charge to all visitors, are animated (squirrels rock back and forth on chairs, for example), lending an extra vitality to the otherwise somber atmosphere. The pride and joy of Sanfillippo’s collection are the white squirrels from Marionville, Missouri, the town that claims to be the white squirrel capital of the world. 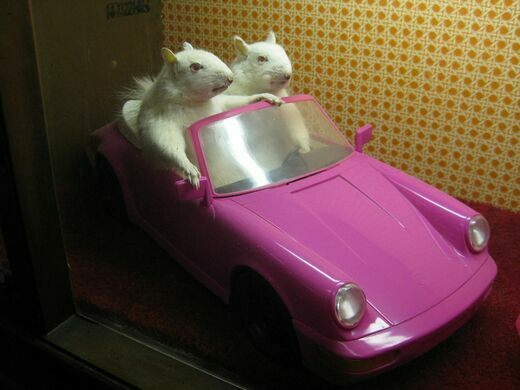 Marionville has the largest and oldest colony of white squirrels in the world, which numbers somewhere between 300 and 600, according to Roadside America. In Marionville, the local Lions Club encourages the white squirrels to stay by building small wooden houses for them and playing nut-bearing trees. How, then, did Sanfillippo collect enough of the tiny treasured animals for his macabre museum? Whenever a white squirrel is found dead, the Lions Club members freeze it and send it to Sanfillippo for preservation. **Sam passed away in spring of 2013 at age 93, and his exhibit is no longer available. The pieces were sadly separated and sold off at auction. In the basement of the Cressy Funeral Home.